Coupons are a great way to boost sales and appeal to new fans ( for a refresher, look at our earlier tip about flash sales). What discount amount works best? 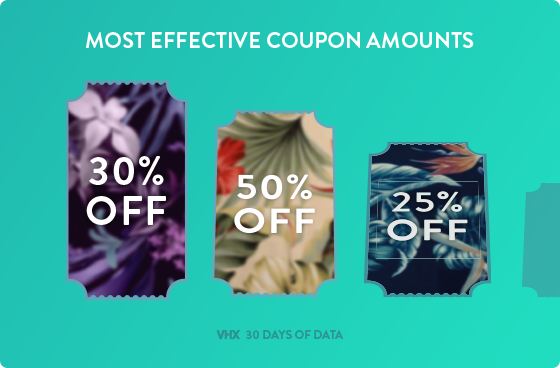 Here’s what we found from Vimeo OTT publishers: The best-performing coupon is 33% off the asking price, followed by 50% off and then 25% off. Anything less than 25% or more than 50% seems to go underutilized by comparison — these amounts may feel like not enough of a deal or too much of a deal. So make sure to give your fans a discount that's juicy enough to feel like a reward, but doesn't devalue your content.